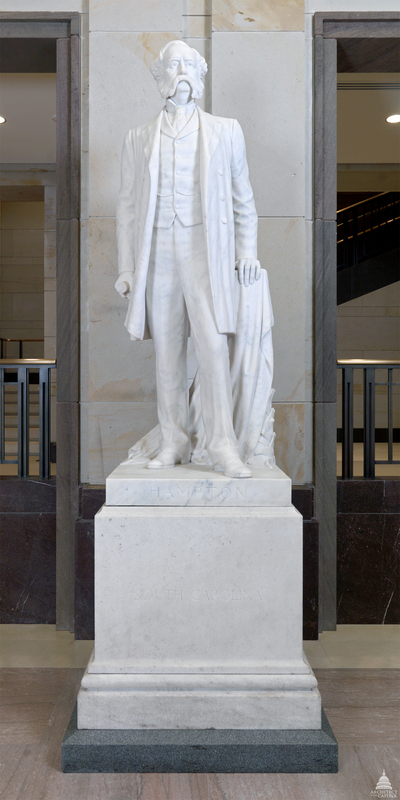 This statue of Wade Hampton was given to the National Statuary Hall Collection by South Carolina in 1929. Wade Hampton was born on March 28, 1818, in Charleston, South Carolina, to one of the wealthiest landowner families in the state. His early years were spent on the family estates at "Millwood" and "Cashier's Valley." In 1836 Hampton graduated from South Carolina College (now the University of South Carolina). After the death of his father, he retreated to his grandfather's Mississippi plantation and assumed the life of a planter. He was elected in 1852 to the South Carolina legislature from Richland County and served until 1856; he then served in the state Senate until he resigned in 1861. Though he had not favored secession, he supported the Confederacy from the outset. He offered his cotton for exchange in Europe for arms and he raised a legion of infantry, cavalry, and artillery. His experience and skill as a horseman made him a superior cavalry officer. In 1862 he was advanced to brigadier general of the cavalry. He was involved in many major battles, including Gettysburg. Hampton was promoted to major general in 1863 and lieutenant general in 1865. From 1876 to 1896 Wade Hampton was a symbol of South Carolina politics, serving as Governor from 1876 to 1879 and as U.S. Senator from 1879 to 1891. From 1891 to 1897 he served as United States Railroad Commissioner. He died in Columbia, South Carolina, on April 11, 1902.